January 27, 2018 By This post may contain affiliate links. 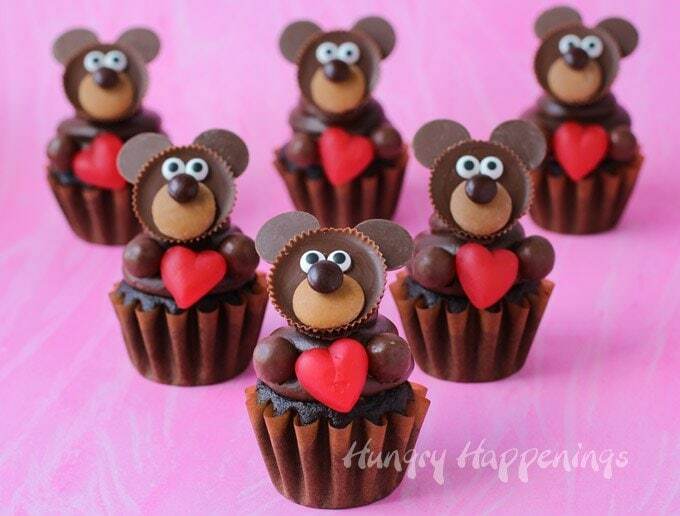 These Chocolate Teddy Bear Cupcakes could not be any cuter. Each one is topped with a peanut butter cup bear and is holding a bright red candy heart. 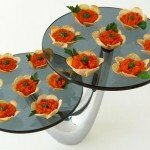 They are perfect for Valentine’s Day. Teddy bears and Valentine’s Day go together as well as chocolate and peanut butter do, so this sweet treat combo couldn’t be more perfect for this winter holiday. 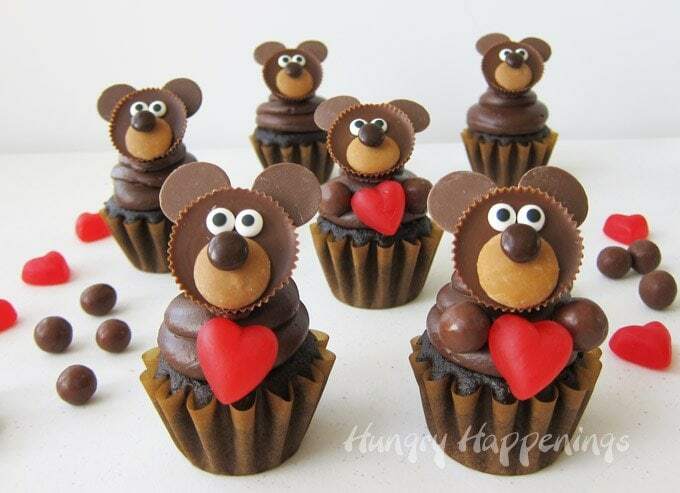 Adorably cute chocolate peanut butter cup bears adorn the tops of chocolate cupcakes. Each holds a bright red cherry candy heart. If you have not yet made cupcakes topped with decorated peanut butter cups, now is the time to give them a try. 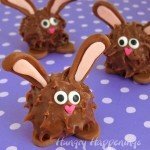 These teddy bear cupcakes are pretty simple to create using chocolate cupcakes and chocolate frosting. I suggest you start by baking a batch of ultimate chocolate cupcakes using the same recipe I used at Christmas to make my Chocolate Reindeer Cupcakes but if you prefer you can use a cake mix or even store bought cupcakes. You will also need some stiff chocolate frosting. You can use my amazing chocolate ganache frosting or make a homemade chocolate buttercream frosting. Grocery store frosting tubs are a bit too soft. If you use that type of frosting add some cocoa powder and powdered sugar to the frosting to thicken it up. Melt some Light Coco Candy Melts. 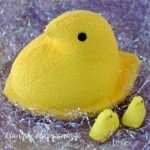 You will only need a small amount of melted candy melts for this project, about one wafer per cupcake, but melting such a small amount can be challenging so I recommend melting a small bowl full. You can always use the remaining candy to dip some pretzels, cookies, or marshmallows. Or you can pour it out onto parchment paper and let it harden to use for another project. To melt the candy melts place them in a a microwave safe bowl and heat on high power for 15-30 second increments, stirring after each until abut 75% is melted. Then let the bowl sit in the microwave for 3 minutes before stirring again. The residual heat from the melted chocolate should melt the remaining chunks. 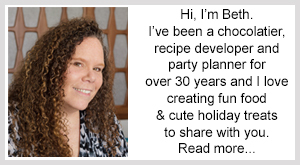 You can find detailed instructions for melting candy melts and keeping it melted for lengths of time on my Chocolate Making Tips Page. Then attach a candy coated chocolate for the nose. Attach two candy eyes just above the snout. Cut two chocolate candy melt wafers so that they fit up against the peanut butter cup. I used a round cookie cutter that is the same size of the peanut butter cup and cut off a curved piece. You can also use a knife, but that is a bit trickier to get a nice curved cut. Attach two ears to each peanut butter cup using melted candy melts. Your peanut butter and light cocoa candy melt wafers might have white spots or streaks on them. This is either fat bloom (where the fat from the candy comes to the surface) or it is scratch marks from the candy rubbing against each other. To remove the white streaks simply rub the wafers up against the palm of your hand. The warmth of you hand will melt away the fat bloom leaving you with a nicely colored candy melt wafer. Attach one Reese’s Peanut Butter Cup bear to the top of a big chocolate frosting swirl. If your frosting is not firm enough you can insert a cookie stick (a Pocky Stick) into the frosting and down into the middle of the cupcake to use as support for the Reese’s Cup. This gives the Reese’s Cup bear something to lean up against so it’s stays upright. You can see this step in the video tutorial below. Add one candy heart just below the bear’s head and place two chocolate malted milk balls on either side of the heart so your bears look like they are holding the candy heart. I used cherry jube-jel hearts. 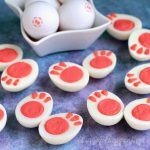 They are the perfect size and color but you can also use Sweedish Fish Hearts, Conversation Hearts, or Sweet Tart Hearts which are a bit smaller. Can I make these cupcakes in advance of a party? 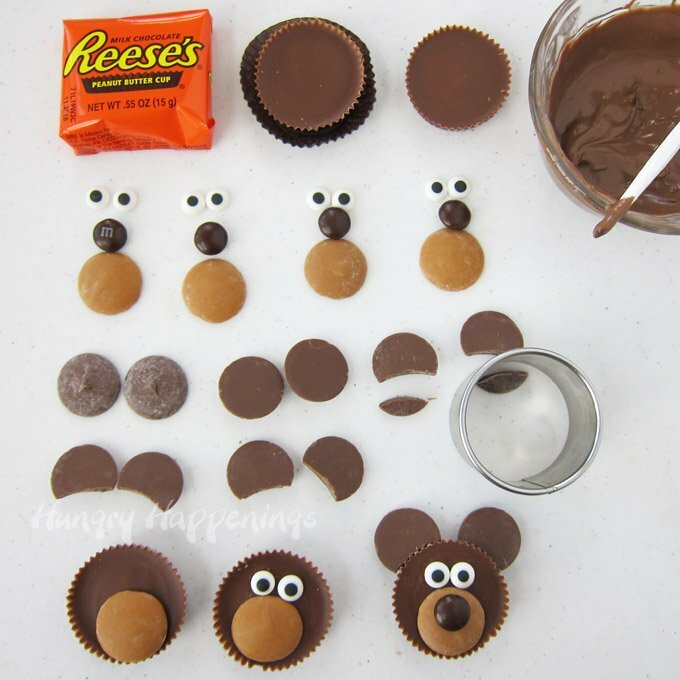 The cupcakes can be stored at room temperature, already assembled, for up to 2 days but I highly recommend you make and decorate the Reese’s Cup Bears and keep them stored in an airtight container then add them to the cupcakes the day you plan to serve them. It is best to attach them to freshly piped frosting if you are using crusting frosting like a buttercream so you will need to frost the cupcakes just before assembly. If you use store bought cupcakes be sure they have a nice big swirl of frosting on top and that the frosting has not crusted. You can bake the cupcakes ahead and even freeze them if need be. 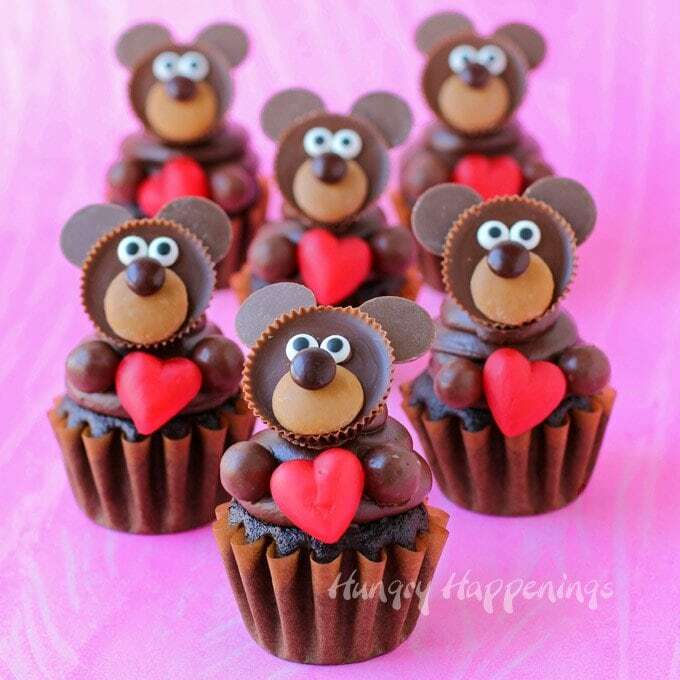 Then the day of your party, pipe on the frosting and attach the Reese’s Cup Bear, malt ball paws, and candy heart. 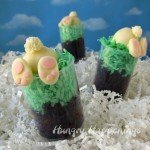 I hope you enjoy making these Teddy Bear Cupcakes. If you do, please leave a comment below and click on the star ratings to rate the recipe too. Before you go, be sure to check out these other fun Reese’s Peanut Butter Cup Cupcake Treats. Next I noticed the fluted cupcake liners so looked on your Amazon link as I don’t think I’ve ever seen brown cupcake liners. Wilton wave cups are what they’re called. They add that little extra “touch”. 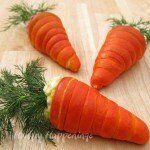 Thanks for posting these adorable little teddies so we can get our ingredients together in time for Valentines Day. Thanks, Tavette. Yes, that cupcake recipe is amazing. It’s what I used to make these teddy bear cupcakes. For fun, I added some peanut butter to the chocolate ganache frosting. It was delish, but needed some tweaking. I’ll make it again and share the recipe. I love those wavy cups. They are so pretty. I need to get some more, being I used my last one making these bears. I definitely recommend them, just know that they are a bit smaller than normal cups, so you’ll make a few extra cupcakes. How did you attach the teddy bear to the cupcake? BTW…they are adorable! 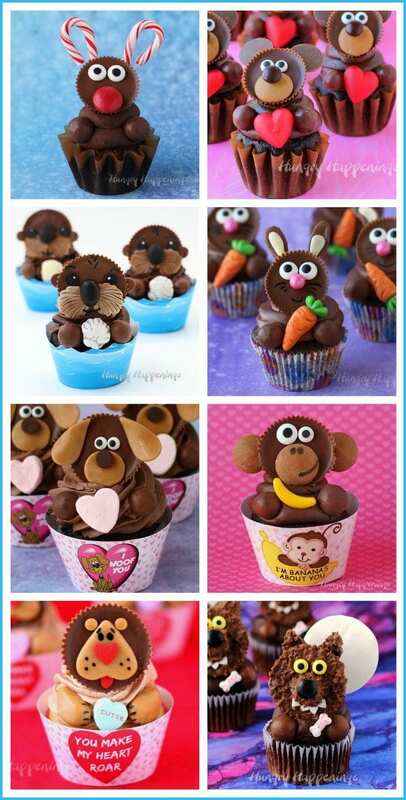 All I can say is these little cupcakes are BEARY cute! Thanks, Kim. I love them BEARY much! I’m so glad you feel these teddy bears are huggable. I do too! You can also copy and paste the tutorial into a word document then print that out.